Conjunctured opened its doors back in July, 2008. After two years of operation, this coworking space in East Austin is thriving. The guys at Conjunctured keep it real with a great and inspirational space, great people and great coffee. The place is inspirational and functional. There is a conference room, a kitchen, a nice lounge, a coworking space and something very cool, a “quiet” room. This is useful for times when you need to do some serious heads down coding, or whatever else it is that you do. Conjunctured’s members are a unique and creative bunch. Members are usually solo-entrepreneurs and small teams. In this group you’ll find people with different skills such as web designers, software developers, marketing, social media, copywriting, search engine optimization, etc… This is one of the cool things about a coworking space, you can throw a question about your site’s design and chances are you’ll get almost immediate feedback, how can you beat that! Coworking is very similar to working at a coffee shop, but better, way better. In a coworking space such as Conjunctured, you get all the things you get at a local coffee shop such as a table to work on, great coffee, tea and snacks but the advantage is that at Conjunctured you have a reliable WiFi, plenty of power outlets (Yes!) and it is safe. If you need to walk out for lunch or whatever, you can leave your laptop, it is OK. Your stuff will be there when you get back. If that is not enough, you have the option to store your stuff in a locker. Another unique thing of this coworking space is the community, the members are a true community that shares ideas and help each other out. In fact, they just launched a new roundtable discussion called “Help a Coworker Out”. Every Friday for 45 minutes, one Conjunctured member’s company is put on the spotlight and all alumni and current members are invited to brainstorm and help that member succeed in their current endeavors. If you are an entrepreneur and are tired of coffee shops or bored about working at home, check out Conjunctured. 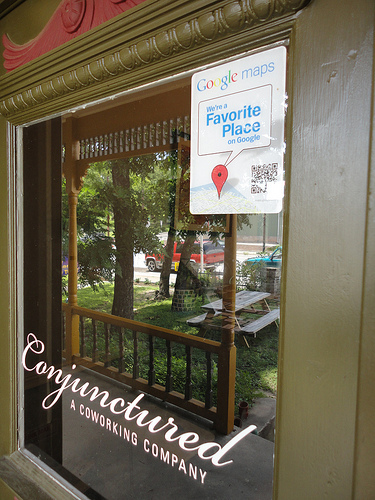 It is coworking Austin style, creative, friendly and affordable. Conjunctured has both daily and monthly rates, offering discounts for a multiple month contract. If you are interested, you can always stop by and they’ll give you the tour, you can also check out their website for more details.